A thread to discuss and post updates on the Beaumont. Looks interesting, the first of two buildings like this should be getting finshed before too long. hood, you read my mind. I was just about to ask if anybody had been by the Beaumont lately to see how the progress was going. I am surprised that they have painted the parking spot stripes already. Is there finished housing in the spot that you took the picture? I am used to see the final detail work like striping done after all the major equipment is moved off site. There are two strips of the rowhouses completed, about 10 or 12 single family homes completed, some occupied and one apartment building completed (one on the left.) This project is massive and will be done in phases. It is between 1/8 and 1/4 done now. I can outline what is done on the site plan later to show whats to come. 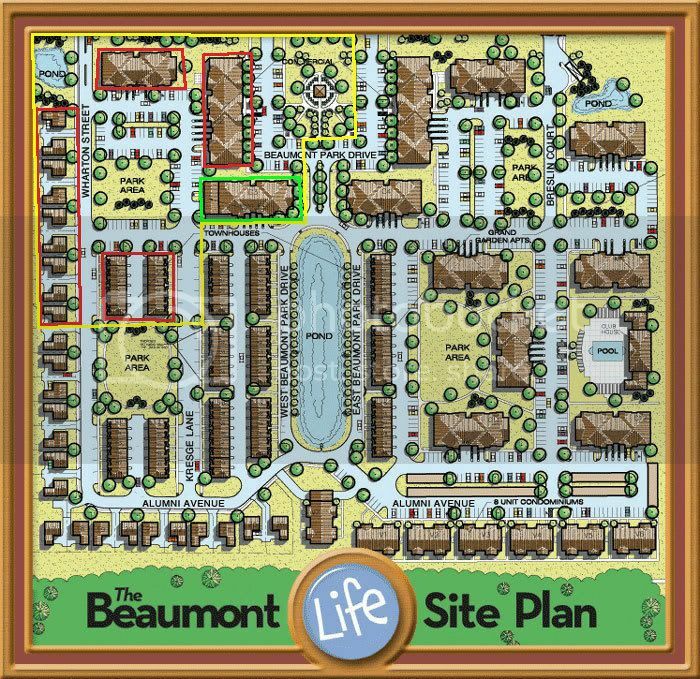 It took me awhile to get around to it, but I finally outlined the areas completed at the beaumont on the siteplan. The red outlines buildings that are completed, the green the one that is under construction and the yellow outlines the entire site area that has been completed. I went by the Beaumont yesterday, and the region that hood yellow outlined is now complete, but it looks like they haven't even started to think about the rest of the development. I wonder if sales have been slow and that is what is keeping them from further progressing. It looks a little odd the way the shopping is, being that only half of the retail space has been built. This development will probably be spread out in quite a few phases. It's going to be really, really hard to get a grasp on what this project will look like completed until it is actually completed. I've got a buddy who told me yesterday he's signed up to live in The Beaumont beginning in the fall. If there's still going to be a ton of construction going on during his stay, and a large portion of the development hasn't been rented out, the duration of his stay may not be the most pleasant. Very slow sales after their initial ceremony to area Realtors. I always expected this development to take 2-3 years to be completed. But once done it will be one of the coolest subdivisions in the Lansing area.